Explores the birth of science, western art! Explores the birth of Democracy! Explores the birth of a military state (Sparta)! Our third Step 4 (ages 11-adult) history course covers the amazing story of the birth of Western Civilization. A thorough study covering the Greek explosion of philosophy and science, war craft and democracy, theater and poetry! No one living in the modern world can afford not to understand the civilization which gave birth to so much of what is of importance today. Many of the political, scientific, philosophical and artistic ideas that live in the Western World today began in Greece, roughly 2,500 years ago. 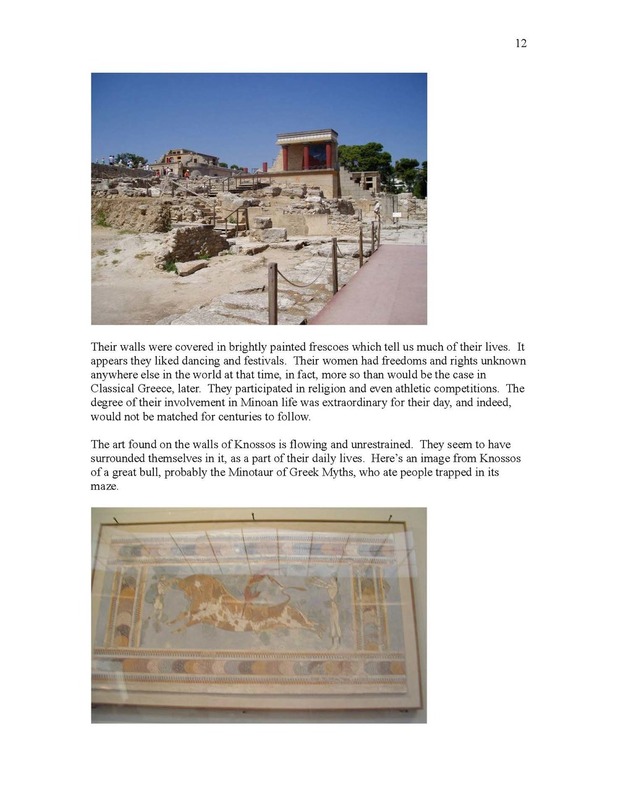 The student learns about the beginnings of Western culture and science, and through various exercises, walks in the footsteps of those first brilliant and inquisitive Greeks. The study and inquiry into the heavens, Earth, life in general and mankind in specific was born with the Greeks. Among the first astronomers were Greeks who questioned the nature of the stars and planets. The first biologists were Greeks who looked for the first time at the living world around them, with an eye for more profound questions than "what's edible". The first great mathematicians were usually Greeks who created much of the basic tapestry of numbers and quantities we are still using today. The student pulls back the curtain separating him from his distant, Western fathers and walks at their side, taking from them much that may be useful today. The most influential philosophers in Western culture prior to the twentieth century, Socrates, Plato and Aristotle, are studied. Much of life today revolves around their early thoughts and teachings. The student compares and contrasts, looking for the best and brightest ideas, those most usable today. Greece was the first "Democracy", and this remarkable experiment in government is considered. The Greek passion for art is explored. The invention of theater is looked at in detail, from the dawn of acting with "Thespis", the first actor, through the invention of tragedy and comedy, the artistic forms that still guide performing artists today. Greek architecture, monumental works such as amphitheaters and the Parthenon, are studied. The student is exposed to the beginning of all Western literature with the Iliad and the Odyssey, the wondrous works of the first story-teller, Homer. Through Sparta, a Greek city famed for its warlike life, the student is introduced to the beginnings of the modern military. The life of perhaps history's most accomplished general, Alexander the Great, is reviewed in detail, in writing and film. 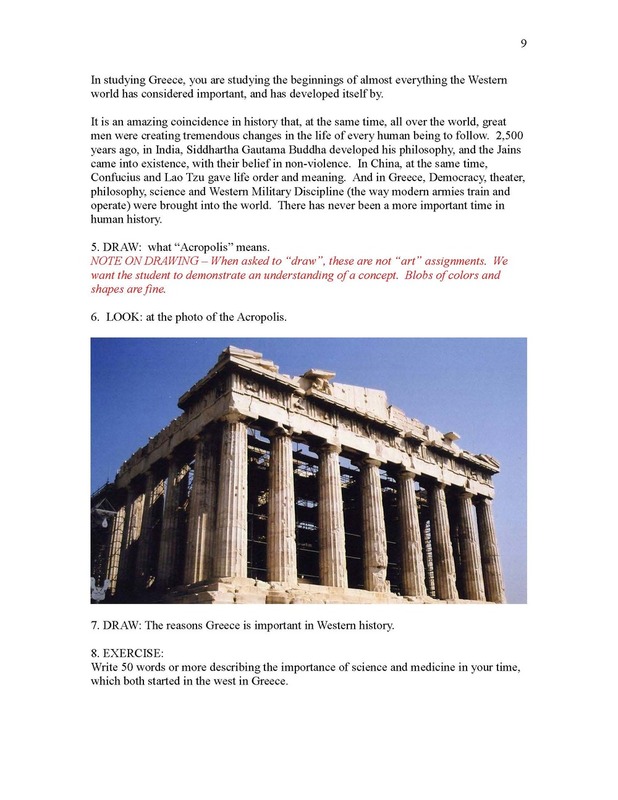 This takes the student on a tour of the Middle East, and into Asia and Africa, just as the genius of Greek civilization was spreading through the globe. The student studies elements of Alexander's campaigns, and determines for himself whether or not he would have done what Alexander did. Additionally, the student compares Athens and Sparta, the two significant and very different Greek city-states, in detail. Upon completing this course, the student will have journeyed through and come to understand the very beginnings of Western science, art, history and philosophy. 71 lesson plans, eight tests and answer guides, 120-150 hours of study – a full semester. H. is about done with Greece. One neat thing was (when she was studying) about geometry and the golden mean. She is studying geometry this year for math and was really able to understand how the Greeks approached this and what they contributed. Certainly made math more meaningful!